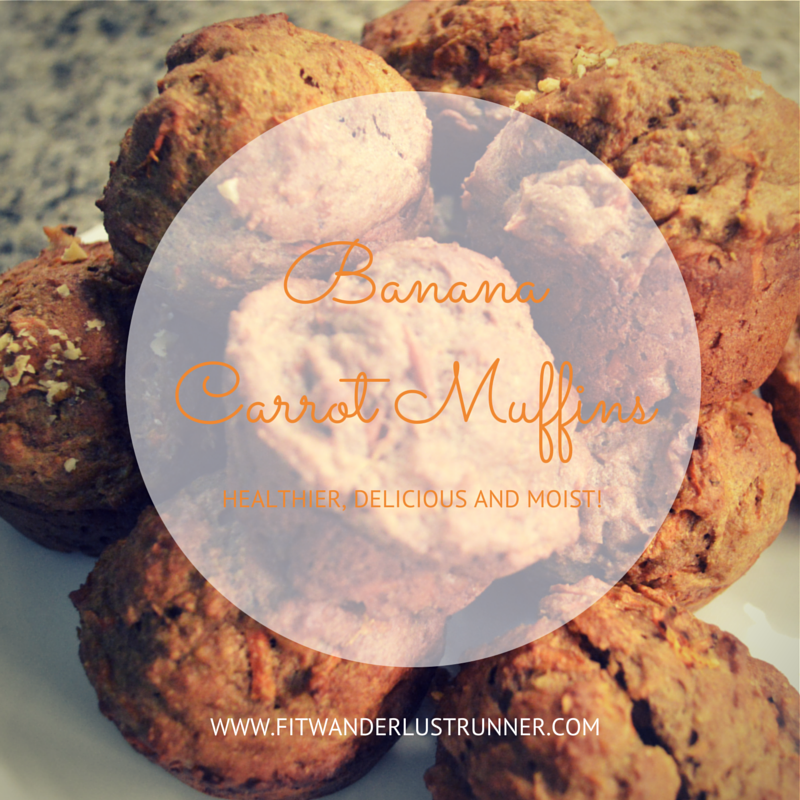 Fit Wanderlust Runner: Delicious Banana Carrot Muffins! It's been awhile since I had posted a new recipe on the blog. I had been really sticking to my usual meals but I am hoping to try a new recipe again each week. We went out of town this past weekend and my last banana went ripe. So I decided to bake something a bit on the healthier side that my husband and I could enjoy. I asked him what he wanted and his response was carrot banana muffins. 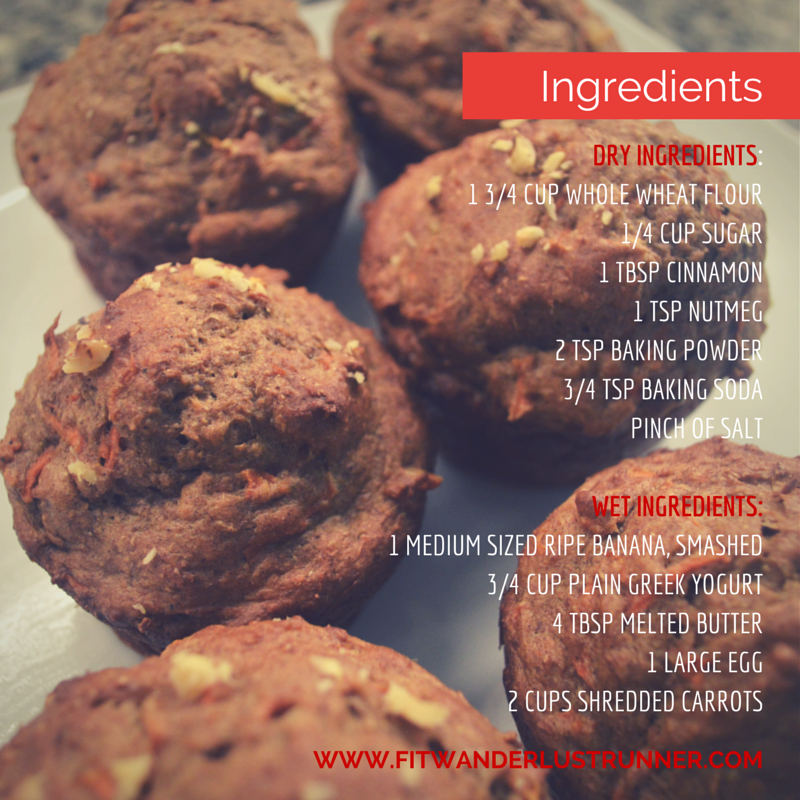 This muffin is great for an on-the-go breakfast or a snack. It contains healthier ingredients so you can eat one guilt free. The best part is that they are pretty easy to make and taste delicious. Most ingredients you will already have lying around in your kitchen. The meal prep consists of just dividing your dry and wet ingredients separately. Pretty basic right? Once you have those done you combine all the ingredients in a large mixing bowl. At the last minute my husband said he wanted some walnuts so I added about 1/2 a cup to this recipe right before placing in the oven. You could also add raisins for added texture as well. Before I even started mixing ingredients I had preheated my oven to 375 degrees. By the time I was done combining all ingredients, the oven was ready to bake. I didn't have any muffin liners so I just used non-stick baking spray on my muffin tray so they wouldn't stick to the pan while baking. I filled mine to about 3/4 of the way and was able to make 12 muffins. The end result were these really great moist muffins. Of course my husband tried them right away and said it was the perfect amount of sweetness he was craving. They aren't overbearingly sweet, but they still taste so good that you would want another one. So if you find yourself with some ripe bananas, go ahead and try this recipe. I am sure you will love the fact that they are quick and easy and above all a healthier version of a muffin. The best part is that they still taste great and not like cardboard. Hope you enjoy! What other recipes do you like to do with ripe bananas? Yum...love banana muffins! Looks great with the carrots, too. I've been really into frozen banana "ice cream". When the bananas get too ripe, I just throw them in the freezer for the next night's little treat! 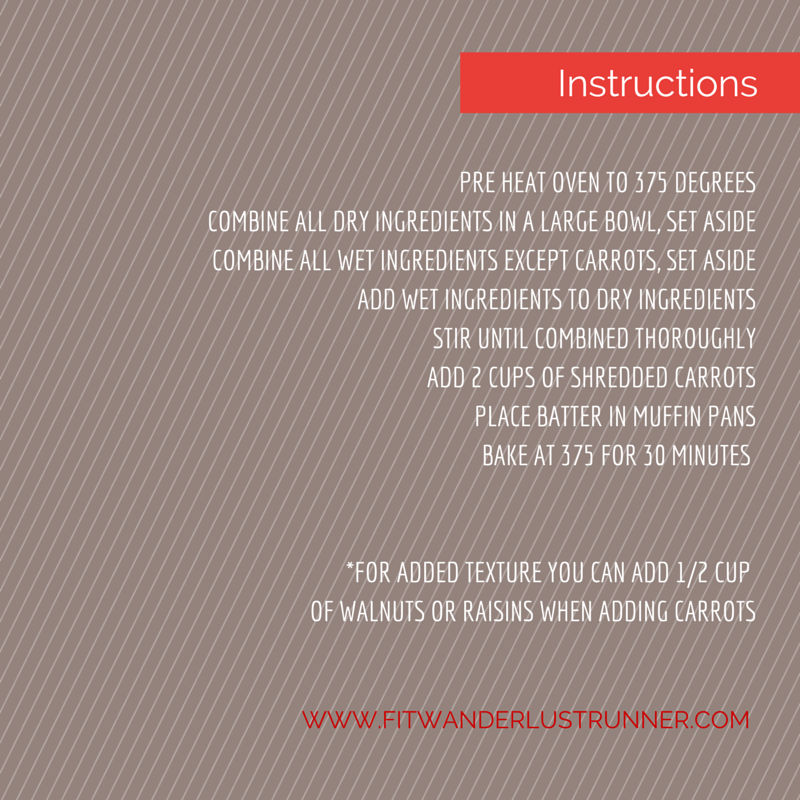 I love a good muffin recipe! I haven't made them in a really long time but this recipe looks really good and I have been itching to bake lately. These dome up so cute. I'm in love. My husband usually asks for banana bread but this time he felt like muffins. They ended tasting really good.